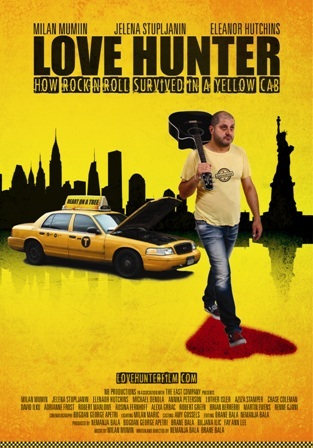 Chicago premiere of the film "Love Hunter - How Rock ‘n’ Roll Survived in a Yellow Cab" was held on February 14, 2015. The premiere took place at the Gene Siskel Film Center. “Love Hunter”, directed by Nemanja and Branislav Bala, is a musical comedy about love and New York adventures of Milan Mumin, the legendary frontman of one of Serbia’s cult bands. Film’s director Nemanja Bala and actress Jelena Stupljanin attended the sold-out premiere and had a conversation with the audience following film’s presentation. The funds raised from ticket sales will be donated to the Serbian Academy "St. Sava" in Chicago, which is located at the Holy Resurrection Serbian Orthodox Cathedral. Following the premieres in New York and Chicago the film has forthcoming presentations in other American cities. The film will be screened in San Francisco on March 5, 2015 at Roxie Theatre and also in Los Angeles from March 13 to 19, 2015 at Laemmle Theatre.